Very rare, highly collectible hand drawn original James Bond poster of the classic 007 movie, You Only Live Twice (1967) for sale. 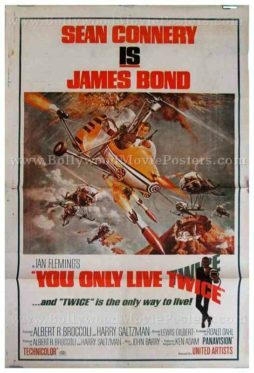 This is a very rare surviving original poster of You Only Live Twice (1967) , which starred Sean Connery in the lead role of James Bond 007! You Only Live Twice has the distinction of being the the first James Bond film whose premiere was attended by none other than the Queen herself (Queen Elizabeth II). Printed and circulated in India somewhere in the 1970s during the film’s release in India, this poster was originally intended for publicity but never ended up being used. This beautiful hand drawn original international poster features a brilliant painting of Sean Connery holding a pistol in classic James Bond 007 style, while seated in a helicopter plane engaged in an air battle. You Only Live Twice (1967) is the fifth spy film in the James Bond series starring Sean Connery as agent 007. The film is inspired in parts from Ian Fleming’s 1964 novel and grossed over $100 million worldwide at the box office. The more recent Austin Powers series is known to have taken the character of Dr. Evil from You Only Live Twice. Highly collectible hand painted original James Bond poster of the classic 007 hit, Diamonds Are Forever (1971) for sale. 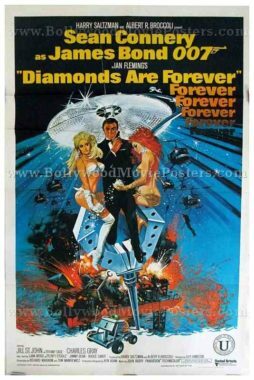 This is a rare surviving original poster of Diamonds Are Forever (1971), which starred Sean Connery in the lead role of James Bond 007! Printed and circulated in India somewhere in the 1970s during the film’s release in India, this international James Bond poster was originally intended for publicity but never ended up being used. 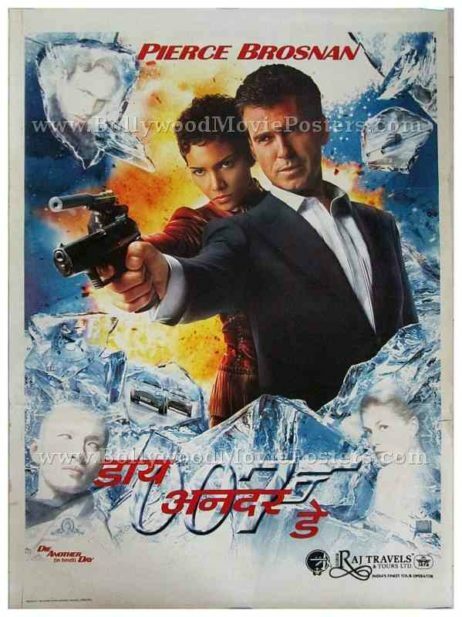 This beautiful hand painted 007 poster features a brilliant rendition of Sean Connery on the center, flanked on either side by two voluptuous women in swimsuits and knee high boots. Diamonds Are Forever (1971) is the seventh spy film in the James Bond series by Eon Productions, and the final to star Sean Connery as 007 James Bond. The film is based on Ian Fleming’s 1956 novel and grossed over $100 million worldwide.